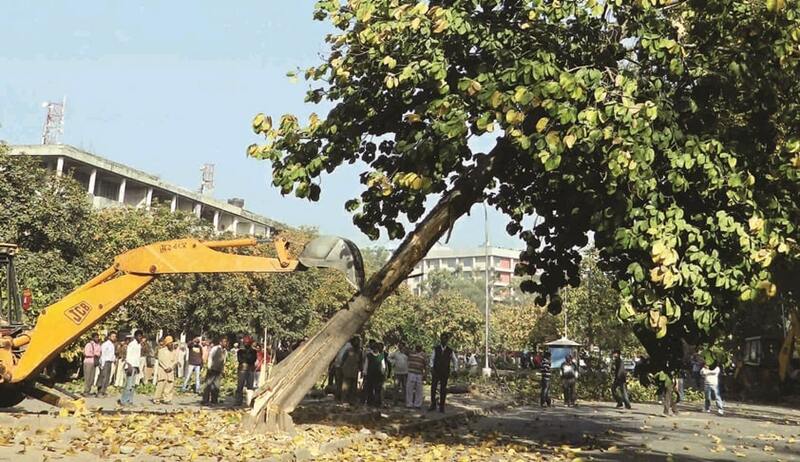 Complying with the directions of the Central Information Commission (CIC) and the Delhi High Court, the AAP government has uploaded on its website information about number of trees felled or pruned from year 2005-17, which shows that 1,12,169 trees were axed in the past 13 years, with 24 trees a day making it one tree felled every hour. The information is available on the government’s website with year-wise tree felling permission record from the year 2011-12 to 2016-17. The details of complaints received on tree helpline together with a number of trees threatened/cut, locations etc., is now available under the tab ‘status of tree helpline’. It is to be noted that the CIC had in the year 2011 allowed the complaint of Saurabh Sharma from Joint Operation for Social Help contending that details of various provisions of the Delhi Preservation of Trees Act be published on the website of the forest department of the Delhi government. He had sought the public to be informed about tree helpline for complaints against illegal felling of trees and other provisions. The Commission had then directed the government to list details of a number of trees felled or pruned since September 2011, with details of the applicant seeking permission. The information was, however, uploaded on the website after advocate Aditya N Prasad moved the Delhi High Court last year seeking compliance of the CIC’s order by making available on its website the details of permissions given for felling and pruning of trees; the details of the number of the trees; locations, the status of the applications received for the said purpose and also the details of complaints received with regard to illegal cutting and pruning of trees. The CIC had way back in the year 2011 directed all civic agencies to display along with monetary cost the “environmental cost” of all construction work indicating the number of trees being felled and the location of the compensatory plantation. The commission had appreciated the Delhi government for progress made in publishing various kinds of information in public domain. “On perusal of the website of the department, it is noticed that information regarding complaints received on the Tree Helpline and requests received for tree felling is available, however the same has not been updated for a long duration and information from all the forest divisions is not available. It is also noted that construction and developmental projects affect a large number of trees, which are felled, therefore the cost of each project is not just monetary but environmental also. The Citizens, who are informed through a signboard at the construction sites about the project details, must also be informed about the ecological cost and the compensatory plantation being done. The disappearance of various species of birds from the City is also attributed to the shrinking number of trees,” the Commission had said. According to information now upon the government’s website, from the year 2005 to 2010, 65,241 trees were felled. In the year 2010-11, 3,502 trees were cut down; while in the year 2011-12, a total of 6,767 trees were permitted to be felled. It was in 2012-13 that 13,770 trees were felled, followed by 8,221 trees in 2013-14. From 2017 till February this year, 2,376 trees were felled. From the year 2006 to 2010, 65,241 number of trees were permitted to be removed with the requirement of 6,89,733 compensatory plantation, of which 3,72,944 plantations are pending. In this time period, 15,276 trees were removed by the Delhi Metro Rail Corporation and 1,51,075 compensatory trees were planted by the Forest Department. As many as 15,762 trees were sought to be felled by the Public Works Department and 2,786 by Rites Ltd. for the Bus Rapid Transit corridor. The website now also has a breakup of trees permitted to be felled by private individuals or builders and the government agencies. For example, it shows that in the year 2010-11, five trees were felled by private agencies while 3,497 trees were felled by government agencies, including 3,091 trees felled at Anand Vihar Railway terminal by the Northern Railways.